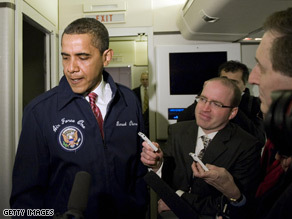 Donning a blue jacket with the presidential seal on the right and his name embroidered on the left, President Obama came back to the press section of the plane shortly before taking off for a trip to Williamsburg, Virginia. WILLIAMSBURG, VIRGINIA (CNN) – President Barack Obama got to experience another first in his nascent presidential career Thursday: a ride on Air Force One as commander-in-chief. Donning a blue jacket with the presidential seal on the right and his name embroidered on the left, President Obama came back to the press section of the plane shortly before taking off for a trip to Williamsburg, Virginia where the House Democrats are meeting. "Hey guys, what do you think of my - this spiffy ride here?” the president asked the group of reporters traveling with him on the presidential plane. Obama had previously been a guest on Air Force One when his predecessor, former President George W. Bush, was in office - but Thursday’s ride was his first as commander-in-chief, and his ride on Marine One seemed to leave him impressed. "It's spectacular,” Obama said. “You go right over the Washington Monument, and then you kind of curve in by the Capitol. It was spectacular." Do you believe that Syria spying on dissidents?